This week we again called on Southwark Council to prioritise secure bike storage – crucial in encouraging more people to cycle. At a meeting of the Southwark Cycling Joint Steering Group* on Friday, September 27, we made the case for investing in quality cycle-parking facilities. We also propose several ways of meeting the demand for more and better cycle storage space across the borough, using East Dulwich Estate as a case study. The All Party Parliamentary Cycling Group has estimated that 70% of the economic benefits of cycling result from health benefits. The local health budget is an appropriate source of funding for cycle parking. The CTC has estimated that each cyclist saves the exchequer roughly £10,000 in diminished health and transport costs. As each rented secure parking space represents a cyclist who in many cases would not have been able to store a bike at their home, the installation of cycle parking is able to clearly evidence the level of success of the scheme: it would be able to demonstrate that investment in cycling is economically beneficial in a straightforward and easy to understand manner. 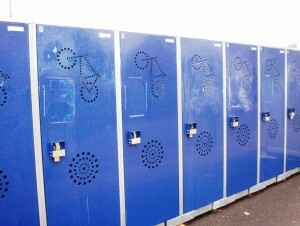 Although a number of newly installed lockers in Southwark are currently unrented, many of the older installations are fully rented. Cyclehoop have confirmed that there are 110 individuals on their current waiting list, which likely underestimates demand as there are still large areas of the borough in which no lockers have been installed, meaning that non-cyclists are likely to be unaware of the scheme. The borough has not yet installed any Lambeth Bike Hangars – a form of on-street secure cycle parking. This allows secure parking to be supplied to areas in which there are no locations for vertical lockers. This particularly applies to the large numbers of subdivided terraced houses across the borough. This new form of parking-supply will increase demand on already-stretched CGS funding. The Greater London Assembly’s Gearing up report estimates that 50% of London residents cannot securely store their bikes at their home. Given Southwark Council’s high levels of social housing, this is likely to underestimate parking difficulties in the borough. A lack of parking fundamentally prevents Southwark residents from travelling by bicycle, thus clearly and directly preventing the growth of cycling in the borough and reducing the cost effectiveness of other cycling investments. Furthermore, as the installation of parking will increase the numbers of cyclists without removing space from the road it is a policy able to encourage cycling with minimal reasons for opposition from local residents. the council’s own regeneration projects should always include a proper survey of residents’ transport needs to plan for future needs and enable modal shifts. opportunities to put in cycle storage should be considered in every estate regeneration scheme and residential street calming scheme. Southwark Cyclists, local residents’ stakeholder representatives and Cyclehoop should always be contacted to confirm demand (or lack of it) for cycle parking. The council could lobby for a larger grant from TfL to provide cycle storage on estates. The council could look at allocating budget from Housing, Street Repair, Health etc to lockers as this is effective way to help people change to cycling. The council could set up its own cycle storage scheme (separate from Cleaner Greener Safer – CGS – funds) covering both estates and residential streets. Given the importance allocated to cycling in the Southwark Council Transport Plan, it is inappropriate that the expansion of secure cycle parking is reliant upon such a small fund. Given the increased emphasis upon “better places for everyone” in the Mayor’s vision for Cycling, having funding for cycle parking in direct competition with funding for hanging planters, door entry systems and other improvements that arises under the current CGS scheme may become problematic in future years. After taking up her position as the Director of Public Health for Lambeth and Southwark, Dr. Ruth Wallis stated reducing or streamlining the bureaucratic costs of gaining planning permission for lockers is an issue she would be interested in pursuing. The Cycling Joint Steering Group should investigate this offer further. 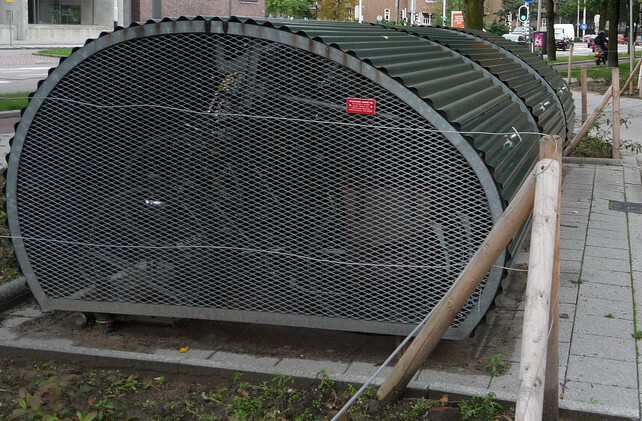 The council could employ a cycle storage officer (as in Lambeth) who could look at site-specific solutions (e.g. converting garages/drying rooms where this is cheaper than installing lockers; helping home-owners purchase the most secure front garden lockers through bulk-buying or spreading the cost over a year). The council could waive the cost of applying for planning permission for every single cycle locker and make it easier for householders/landlords to install front garden lockers. Some good ideas about planning permission have been put together by Ealing Cycle Campaign. Pilot and approve types of storage other then the vertical steel locker. Southwark has about 39,000 housing units under management and is promising another 10,000, plus leaseholders. We estimate. based on 10% cycling by 2020, this means10,000 cycling. Last year, Southwark spent £85,000 (including £50,000 from Transport for London) to install a total of 102 lockers on estates across the borough. It will take a century to make a dent in demand. 10,000 storage spaces for Southwark citizens could be achieved by creating 2,000 new spaces during each of the next 5 years. 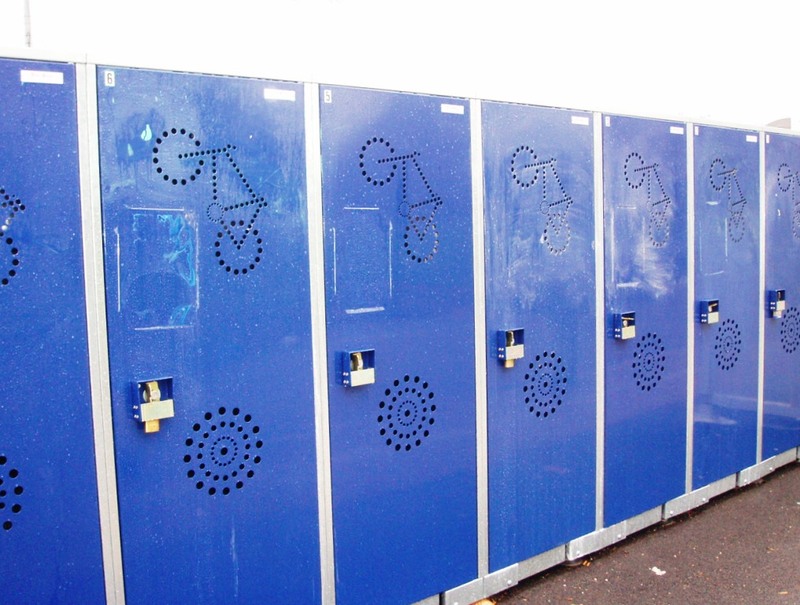 Using existing costs for Bikeaway lockers (around £875 per locker), this would come in at £1,750,000, but we believe it could be done more efficiently by being more flexible. This includes flexibility with regard to solution (e.g. use of other spaces such as old drying rooms), flexibility in planning and deployment of greater staff resources, vital to finding and making new facilities. East Dulwich Estate (EDE) is a 1930s estate with 750 flats in four- and five-storey blocks with no lifts. Bikes cannot be kept on walkways and few flats have balconies. It is 20-30 minutes to cycle to London Bridge/Waterloo. Only 30% of residents own cars. There are currently two ways to fund lockers on existing housing estates in Southwark: the Cleaner Greener Safer fund and the TfL-funded scheme. The only model of storage approved by the Planning dept is the vertical steel locker. Rental is managed directly by the supplier (Bikeaway or Cyclehoop), costing tenants between £30 and £45 per annum. Residents contact councillors and/or council officers about bike storage. Plans are made for £1.5million extensive landscaping of EDE (repairs to walls, new paving for courtyards, planters, meadows etc). However, there are no plans to include cycle storage. Southwark Council are asked about EDE being considered for the TfL scheme. The reply is that residents’ interest needs to be proven, but EDE will be put on list. A survey of the residents of two blocks shows many are able and willing to cycle but have nowhere to keep bikes. The results are sent to Southwark Council. Officer says estate will be put on the waiting list for the following year. Resident and Southwark Cyclists member Eleanor Margolies’s application to the LCC Community Cycling Fund funding for lockers is unsuccessful. Southwark says EDE is not eligible for TfL fund for lockers because the lockers should be paid for by the regeneration scheme (even though this is a council estate being regenerated by the council). Residents work with landscape architect to agree 90 locations for cycle lockers. Planning permission granted March 2013. There is no funding for lockers within estate regeneration budget. Nevertheless, having planning permission will save (Southwark, the project team, any future charitable funders) the cost and effort of getting individual planning permission for lockers. Another application by Eleanor for funding for lockers, from the CGS, is unsuccessful. The estate regeneration project team (EDERPT) applies for CGS funds – successful this time! Twenty lockers to be installed in 2013. This covers less then 25% of the lockers for which we have planning permission, so we are still looking for other sources of funding. New criteria for TfL scheme are brought in: estates within 1.5km of the new Cycle Super Highway 5 will be eligible for lockers. EDE is now eligible but Housing Manger tells Transport that lockers aren’t needed. No attempt made to contact TRA or EDERPT; no record of previous interest in lockers. Residents win agreement from Planning Committee that full survey of residents transport needs should be carried out before plans are finalised, rather than just visual parking count. Residents apply to be part of the bike hangar trial via the LCC website. No response so far. This estate has proven interest among residents, a landscape architect and group of residents have thoroughly considered options for sites, and we have planning permission in place. Yet it has taken three years and a lot of work to get just 20 lockers. Failures of record-keeping and lack of communication between departments have blocked progress. *An ongoing consultation partnership organised by Southwark Council to collate feedback and suggest new actions for the borough’s cycling strategy.